AND to use a paper punch somewhere on your design! I'm sure we must all have at least one of those...maybe more!! ^.^ Don't forget that everyone who takes part will go into a random draw to win a Funky Fairy download of their choice...and also, that there are some fantastic FREE papers available from the Inspiration Blog! 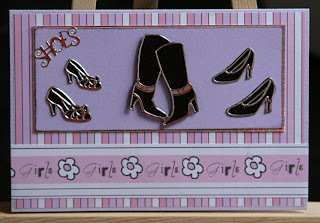 The Funky Fairy challenge this week is a tutorial for making one of these drawers. A set looks even better! 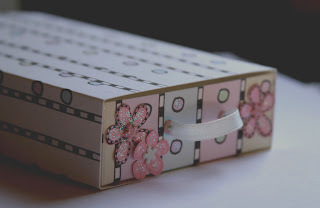 You only need 1 and a half pieces of card for the drawer and sleeve so have a look at the Funky Fairy Challenge blog or Inspiration blog for the details. 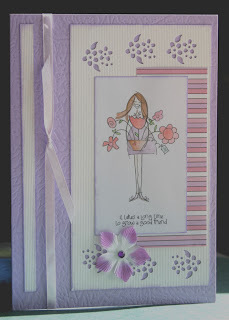 My drawer uses 2 different 'Do ya Doodle' designs printed to card with 'Doodles for Daniel' flower stamps, Making Memories brads and my usual lashing of holographic glitter glue! I will do more for myself at some point but I made this one in advance and decided to use it as a little present and filled it with craft bits for my neice. She has just come out of hospital (chemo for leukaemia) and we visited her at the weekend while we were in the UK. I did think of putting sweets in but craft stuff is healthier and will give her something to do while she's off school etc. The instructions were really easy to follow and the finished drawer is just a bit smaller than A5 in size. Here is my version of this week’s Ismaki sketch: An A5 size card. It's for the SBS13 swap so close your eyes Linda! I made up the ‘long sentence’ the challenge calls for and it’s in French so I hope it is correct: ‘Sur le voyage, nous sommes tous sœurs’ = On the journey, we are all sisters. 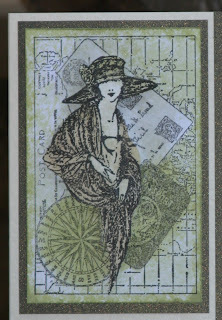 First Hampton Art stamp decoupaged with 2nd layer of the woman. Second Hampton Art stamp uses just a small part of the stamp to give me the 4 squares I needed. 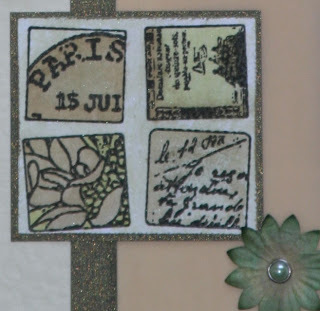 These were both stamped with black Brilliance and coloured with Distress inks (Frayed Burlap & Shabby Shutters): Stamped these on to waxed paper and picked up and mixed the colours in a mixture of sponging, painting and dragging the distressed edges through the ink. Sentiment printed on to pale brown Papermania vellum; green-gold paper from The PaperMill shop, Papermania brad, paper flower also coloured with Distress inks. Off to the UK for a few days tomorrow so thought I'd leave you with a few challenges before I go! 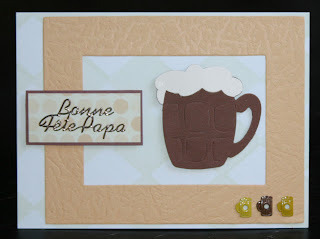 This one is for a swap on the Docrafts site and uses the Cartes Maniak challenge sketch for this week. 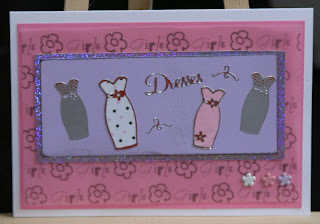 Used Funky Fairy papers, Pink Petticoat image, Papermania flower, X-cut punch. I set the challenge on the Funky Fairy Challenge this week: I was inspired by the new Girls and Boys papers to make the challenge Stars and Stripes: Details are on the challenge blog if you want to join in - A random winner will get their choice of download from Funky Fairy Papercrafts! I had the idea to make a door hanger but my son wanted different papers so I made one for him and then a stars and stripes one for the challenge! All the papers are from Funky Fairy 'Girls and Boys'. The big stars are from the papers and enlarged on the computer: Love the flexibility of downloads! I was asked yesterday for another A4 card and they needed it in a hurry so I made this one this afternoon. The photo was literally taken on the run as I suddenly remembered I hadn't taken one! Fortunately my son has been on a school trip today and my husband went with them so I have had the house to myself: Made the most of it - Crafted all day!!! 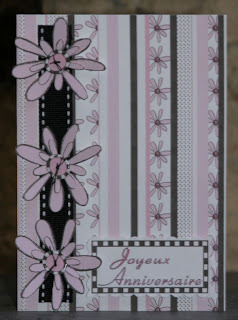 Used: Range of card stock from my stash on to which I printed the sentiment and numbers and used X-cut punch and border system. Flowers are: Funky Fairy 'Doodles for Daniel' Flower stamps with Moonlight White Brilliance ink pad and holographic powder and Papermania Pearly brads. 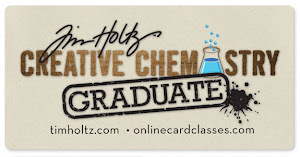 Here is my last minute Cartes Maniak card for this week, ie week ending any minute now! Your challenge for week #15, if you wish to accept it, (and why not? You're brave), is to design a MALE/BOY themed card. 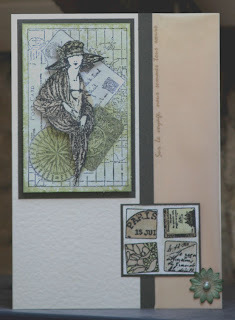 I've had great fun with this challenge as Louise set the challenge and sent out a packet of goodies to use with them: That made it extra hard for the design team in some ways but it was lovely too. So, if you want to join in the fun have a look on the challenge blog here. 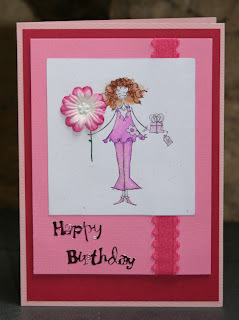 I had already made my cards when the new Funky Fairy paper sets which includes really gorgeous and unusual 'Boys and Girls' came out but you can see them on the challenge blog and in the Funky Fairy shop here! 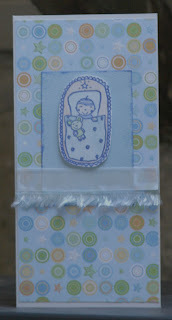 I used 'Cool Co-ordinates', 'Colourful Daze' and 'Blue' paper ranges. 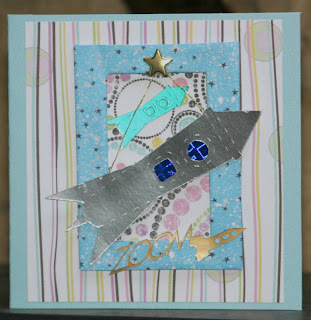 The last card, just in case you're wondering what the thread is for, includes a suspended rocket so it does move! I remember seeing this award a little while ago and thinking how lovely it was so I am really pleased to be awarded it by both Gill and Cathy - Thank you both! There are 5 rules and they are as follows- 1) You have to pick 5 blogs that you consider deserve this award for their creativity, design, interesting material, and also contributes to the blogging community, no matter what language. 2) Each award has to have the name of the author and also a link to his or her blog to be visited by everyone. 3) Each award winner has to show the award and put the name and link to the blog that has given her or him the award itself. 4) Award-winner and the one who has given the prize have to show the link of "Arte y Pico" blog , so everyone will know the origin of this award: http://arteypico.blogspot.com 5) To show these rules. 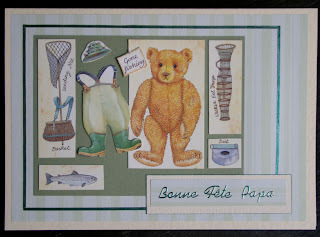 Heike: http://stampingbalou.wordpress.com - great collection of cards and a bi-lingual blog! 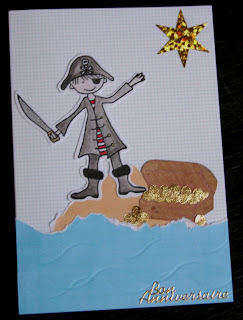 Jozza: http://jozzasblog.blogspot.com - One of the new members of the Funky Fairy team - I like your style and humour Jo! I mentioned while helping my son build this fort today that it was crafting so he insisted we took a photo and it was blogged! It took a lot longer than most cards/projects! 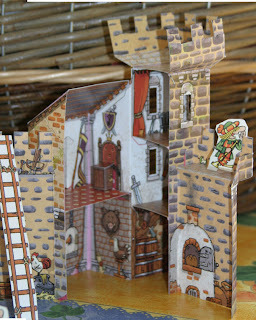 It is from the children's french book series 'J'aime Lire' and the detail in it is fantastic, which is more than can be said for the instructions! The photos don't do it justice but can you spot the hanging prisoner cage and the throne, which is also a secret passage door? 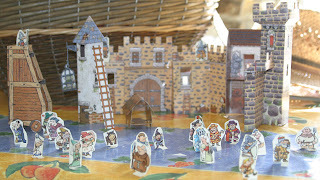 My son cut out the people and has played with it all afternoon: Great fun! NEW Funky Fairy papers released! The first card above was made following the sketch for Ismaki challenge 10 a few weeks back but there was a delay in releasing the papers so I've had to sit on my hands until now! 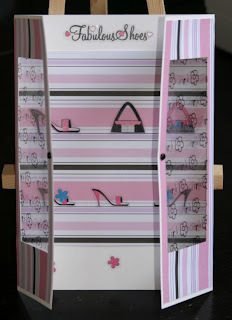 It includes printing one of the papers on both pink vellum and on acetate which is why I love downloads - so versatile. 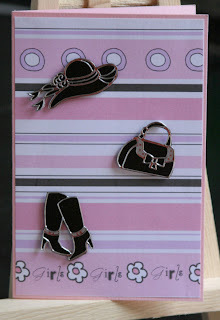 I really enjoyed having a good girly play adding the dresses, shoes, bags, etc. These go soooo well with the brilliant Pinkie Pops and lots of other Funky Fairy sets so it is really easy to mix and match but there is also loads in the collection as it is. The boys section is totally fab so it won't be long before you're seeing lots of that too! 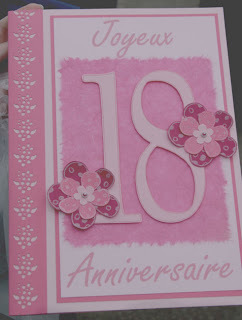 I wanted to make a card for my niece who is in hospital at the moment - something girly and teenage (she's 15). She's been battling leukaemia since she was 6 and is having a particularly rough time at the moment trying out a new chemo so I hope this cheers her up a bit. 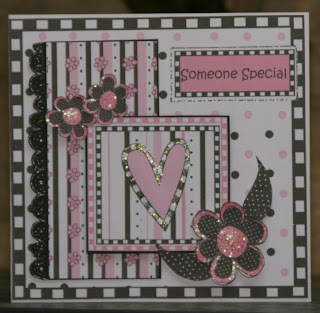 I used this week's Ismaki sketch, including the option of having 3 flowers, with Funky Fairy Pinkie Pops papers and toppers, glitter gel pen and lashings of holographic glitter glue to accent the flowers and heart. Fellow Funky Fairy design team member Lydia has her birthday today so this card got posted off earlier in the week: Hope it's there and you're having a great day Lyds! Image: Pink Petticoat, painted with H2Os, Maya Road (I think ?) ribbon. Nikki is offering blog candy and being congratulated for hitting 15000 visits but it's actually 16000+ already! Mega! Well done you.